Iv'e just recently had to start doing some Sharepoint based work, and as a result have had to basically throw myself in on a crash course, learning to use it. In one of the tasks I have, I'm required to create a custom list called a JobQueue. As you can see, there are three boolean items, IsTodo, IsInProgress and IsDone. A job can only be in one of the 3 states at any given time, so is it possible for me when a user of the site adds a new item to the to enforce only one item being ticked at a time. Ideally, I'd like that if IsInProgress is ticked, then the other two are automatically un-ticked, or if IsDone is ticked, then IsTodo and IsInProgress become un-ticked, I'd also like to be able to make this happen both when adding a new item, and when editing an existing one. Is there a way I can make this happen just using the standard Sharepoint stuff, or am I going to have to start writing extensions for this? 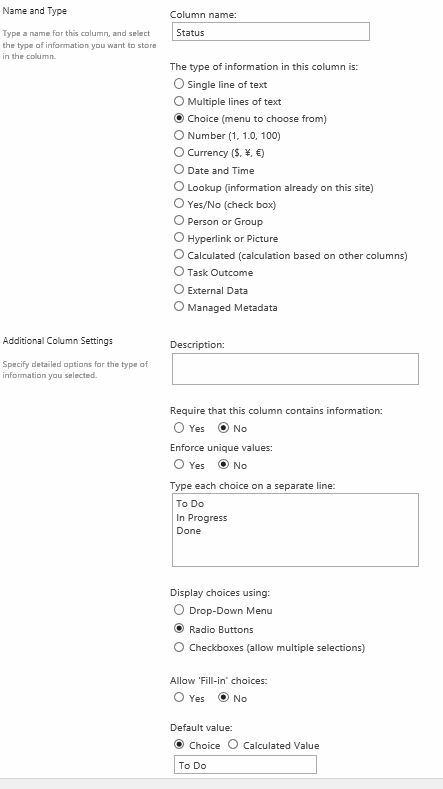 Simply change the three state fields to a Choice column with 3 choices "To Do", "In Progress", "Done". At the bottom of the Column definition there will be a default option. Set this to the To Do. You can set to type radio button. Not the answer you're looking for? Browse other questions tagged list custom-list splistitem or ask your own question. How to fire off a workflow by clicking a link on a page…?